Between 2002-2011, the international non-profit NGO AVSI Foundation has supported Uganda’s Ministry of Health (MoH) prevention of mother-to-child HIV transmission (PMTCT) program in four Northern Ugandan districts: Kitgum, Lamwo, Pader, and Agago. The program “aimed to be comprehensive, emphasizing social and medical care and support” and was successful in reducing HIV prevalence among HIV-exposed infants from 10.3% in 2004 to 5.0% in 2011, among other things. The MoH/AVSI PMTCT sites showed how a “comprehensive PMTCT program emphasizing social and community engagement alongside medical care and support can succeed in a remote setting with multiple challenges” (3). Despite the advances of the MoH/AVSI program, HIV/AIDS remains a critical issue in Uganda. Northern Uganda especially faces dispropriate challenges and adversities in regards to the national HIV/AIDS epidemic response. In 2011, the Uganda AIDS Indicator Survey measured a national HIV prevalence of 7.3%, but the HIV prevalence in northern Uganda specifically was shown to be 8.3%. Also, Uganda has one of the largest crude birth rates in the world. In 2011 Uganda’s birth rate was 42.1/1000 (3). In addition, Northern Uganda has faced great adversity from the Lord’s Resistance Army (LRA) during the period 1986-2006. There was an estimated two million individuals mandated to live in “internally displaced people” (IDP) camps from this violent discord (3). The fallout from the war between the government and the LRA had worsened already sparse health services in the north. Due to the high birth rate, HIV prevalence, and structural violence faced in northern Uganda, the AVSI Foundation proposes to extend the MoH/AVSI PMTCT program for an additional five years with support from the Global Fund. 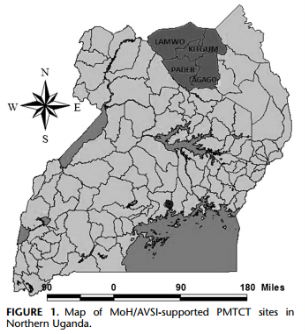 Support from the Global Fund will allow us to broaden PMTCT services in 24 Northern Uganda MoH facilities (located in Kitgum, Lamwo, Pader, and Agago) and help expand these sustainable PMTCT service sites to other MoH facilities nationwide. The first and foremost goal is to reduce HIV incidence among HIV-exposed infants by reducing Mother-to-child Transmission (MTCT) of HIV. MTCT occurs when an HIV-positive mother infects her infant with HIV during pregnancy, labor, delivery, or breastfeeding (1). Yet, the risk of transmission can be reduced to less than 5% if mothers undergo proper maternal ART treatment. The diagram below illustrates the many steps mothers need to take to successfully complete a PMTCT program. This series of complex steps is why it is absolutely critical to assist Ugandan mothers as much as possible to make successfully complete our program. However, even if HIV-positive mothers complete a PMTCT program in all of its entirety and give birth to an HIV-free infant, infants still remain at risk of HIV infection. Other channels, such as contaminated needles, can infect an infant who was initially born HIV-free. Thus, maintaining and promoting strict sanitation procedures, alongside a strong PMTCT program, is absolutely critical in reducing HIV incidence among HIV-exposed infants. The table below summarizes the PMTCT Indicators “number of HIV-exposed children (18 months or younger) tested” and the “number of HIV-exposed children (18 months or younger) that tested HIV-positive” measured by the MoH/AVSI program between 2002-2011. This data was used to formulate Year 1 and project a realistic target for Year 5. One of the main objectives is to increase the proportion of HIV-positive women who deliver in health facilities. It is absolutely critical for HIV-positive women to deliver in health facilities. After all, health facilities can provide better medical care and support than a traditional midwife would be able to in a home delivery. Furthermore, health facilities have more resources, equipment, and personnel to respond to any emergencies during delivery. Above all, delivering in a health facility will better guarantee the infant receives the appropriate antivirals need to PMTCT. HIV-positive women delivering at home run a higher risk of these crucial medications not being administered. Thus, increasing the proportion of HIV-positive women who deliver in health facilities better protects both the mother and the child, than a home delivery. The table below summarizes the PMTCT Indicator “percentage of HIV-positive women who delivered in health facilities” measured by the MoH/AVSI program between 2002-2011. This data was used to formulate Year 1 and project a realistic target for Year 5. Another objective is to increase the number of mothers who undergo HIV testing while in ANC. There are clearly many benefits for at risk individuals undergoing HIV-testing. However, the benefits of having undergone an HIV test are lost if the patient does not return to learn their result. Thus, it is absolutely crucial for our program will utilize “rapid testing at a women’s first antenatal clinic visit” (1). In contrast to a “conventional HIV test” that can take days or even weeks to attain results, “rapid tests can produce a result in as little as twenty minutes” (1). This will allow reduce the number of HIV-positive women who are lost from lack of follow-up and will also facilitate rapid enrollment of HIV-positive pregnant women into PMTCT program services. The table below summarizes the PMTCT Indicator “ANC women tested for HIV” measured by the MoH/AVSI program between 2002-2011. This data was used to formulate Year 1 and project a realistic target for Year 5. Another objective is to increase proportion of HIV-positive mothers on ART treatment (e.g. antiretroviral prophylaxis or triple antiretroviral therapy, depending on the circumstance). However, “to be fully effective, antiretroviral medication needs to reach newborn babies as well as their mothers” (1). The table below summarizes the PMTCT Indicators “number of HIV-positive women who received ARV prophylaxis” and “percentage of ANC HIV-positive women started on prophylaxis” measured by the MoH/AVSI program between 2002-2011. This data was used to formulate Year 1 and project a realistic target for Year 5. Specifically, our program will utilize and adhere to the 2013 World Health Organization’s (WHO) Option B guidelines for PMTCT (until subsequent more effective recommendation plans replace it). The WHO’s 2013 Option B advocates to provide “Provide all HIV-positive pregnant or breastfeeding women with a course of antiretroviral drugs to prevent mother-to-child transmission” (2). They explicitly state that a triple-drug antiretroviral treatment should be administered throughout pregnancy and delivery. Furthermore, breastfeeding mothers should persist on the triple-drug antiretroviral treatment until at least one week after stopping breastfeeding. The steps and procedures of Option B are outlined in the flowchart below. Another objective is to Increase antenatal (ANC) care attendance for mothers. After it has been shown that “A number of clinical processes, such as antenatal care and safe delivery, can improve the health of both mother and child” (4). ANC services offer certainly offer many benefits for mothers but their benefits (just like in HIV-testing), are lost if women do not take advantage and utilize these services. There are numerous reasons a mother may not seek ANC services, even if they are “free”. A huge factor is accessibility difficulties. Pregnant women in low income countries, like Uganda, often have an increased difficulty in utilizing maternal programs because of their busy schedules. They are heavily occupied in caring for children, working, and running numerous kinds of other errands. Furthermore, many mothers live far away from health clinics and may lack a reliable means of travel. Both of these issues creates a huge barrier for women who need antenatal care services, but struggle to access it. Thus, our program will offer basic care and support services (such as food/transportation vouchers, housing assistance, and child-care services) to help increase ANC attendance. After all organizations, such as Partners in Health, have proven that by seeking to overcome the “social barriers” to accessing care by implementing “wraparound services [e.g. transportation costs ]” can help in addressing some of the “social and economic determinants of ill health” (4). The table below summarizes the PMTCT Indicator “ANC attendance” measured by the MoH/AVSI program between 2002-2011. This data was used to formulate Year 1 and project a realistic target for Year 5. One of the main activities to be conducted is providing free and accessible HIV testing and antenatal care for mothers. Indeed, it has been proven, on behalf of the structural adjustment era, that “user fees in many resource-poor settings deterred the poor from accessing any health services (4). Likewise, charging service fees for PMTCT services would create a huge barrier for the poorest northern Ugandan mothers. On the other hand, providing financial support to mothers would encourage and give incentive for mothers to continue to attend and adhere to PMTCT program services. Thus, financial support will be given to mothers who attain antenatal services and HIV testing. This will not only help support poor Ugandan mothers, but will also reduces the likelihood of mothers being lost by lack of follow-up. Another activity that will be conducted is using maternal mobile teams to reach at risk mothers who have an increased difficulty and/or refusal to travel. After all, some pregnant women, despite being offered transportation services and/or financial support, will refuse to deliver in health facilities for whatever reason. Therefore, maternal mobile teams will be trained to provide “services such as HIV education, testing and counseling, and advice on infant feeding” (1). Maternal mobile teams should be used for the women who deliver at home and ensure that those who have tested positive for HIV have access to the essential antiretrovirals needed for PMTCT. Indeed, keeping track of mothers (especially HIV-positive mothers) who plan to delivery at home will be a challenge. Consequently, this will be a major a coordinating responsibility of community health workers who will be responsible for the gathering the necessary records (i.e. HIV-positive pregnant mothers) to pass on to the maternal mobile teams. Additionally, HIV counseling for mothers and their partners will be provided at no cost. Indeed, biomedical treatments are not the only thing needed for a successful HIV intervention. Social and emotional support are also crucial. Unfortunately it can sometimes prove difficult to persuade men to attend such services that are often regarded as “women’s clinics dealing with women’s issues” (1). Nevertheless, another vital activity will be to train and engage community health workers who will be paid to promote maternal education and social support to mothers. After all, the use of expert clients and other community-based volunteers helps reduce the stigma and discrimination of mothers living with HIV. It also helps improve the utilization of basic care services and adherence to Antiretroviral (ARV) Therapy. The term “expert clients” refers to people who are currently HIV/AIDs positive who serve as experienced role models for other PLHIV. Currently, expert clients work in almost every Ugandan ART site, engaging in various activities ranging from promoting health education to providing psychosocial support for PLHIV. Furthermore, mothers will be either followed up with an invitation to come to the health facility for specific interventions/services or visited by a team of health professionals (i.e. a maternal mobile team). Our goals and objectives fit within the National Plan because they complement and scale-up an HIV infection prevention campaign to one of the most disadvantaged regions in the country, Karamoja. This 2013 campaign, called Elimination of Mother-to-Child-Transmission of HIV (eMTCT), is part of the Ugandan government’s large-scaled efforts to prevent new HIV infections. Furthermore, our goals and objectives further assist Uganda in their Ministry of Health 2010-2015 Scale Up Plan for PMTCT that aims to “achieve an HIV-free generation of Ugandans by 2015 through the virtual elimination of MTCT of HIV”, which utilizes a Sector-Wide Approach (1). Indeed, it is extremely critical to work with the public sector and not against the public sector. Our program is committed to working in public sector PMTCT health systems because “only governments can enshrine health as a human right and then implement programs to safeguard this right for its citizens on a national scale” (4). a) We will involve Ugandan mothers by providing HIV counseling services for mothers and their partners. Social support is a crucial component of providing medical services. Indeed it has been shown that when “male partners are involved, both partners can get tested for HIV, know their status, and therefore improve the baby’s chances of a healthy survival” (1). Furthermore, counselors are better able to “emphasise the man’s responsibility for protecting the health of his partner and family” and can also advance the use of PMTCT services, “resulting in much higher rates of treatment uptake” (1). b) Community participation will be fostered by using community health workers to promote awareness, attendance, and adherence to PMTCT services. Specifically, community-based female volunteers who are “expert clients” (current HIV-positive mothers who serve as mentors and have experience with overcoming HIV-related stigma) will especially be invaluable. After all, community health workers can gain the trust of mothers who will thus be more likely to adhere to PMTCT services. c) This PMTCT campaign will help to improve the status of women in Uganda by empowering mothers to be active, confident, and assertive actors in the health of their children. Indeed, educating women is crucial to improving the health of infants. By increasing maternal education for mothers, indicators such as infant mortality will be reduced. d) Social equality is promoted by providing free antenatal care, HIV testing, and free antiretroviral treatment (WHO’s Option B); we are removing the financial barrier that would keep the poorest mothers from attaining maternal services. Indeed it is of the utmost importance to avoid punitive user fees” and other “cost-sharing devices that shift the burden of payment to those least able to pay” (4). As mentioned previously, charging user fees for services would exclude poorer populations. Not only will free treatment be provided, but financial support will be given to women who adhere to therapy. e) There will be an emphasis on education and expansion of programs nationwide to promote human resources development. We will train community health workers. These community health workers will pass on their training to mothers. These mothers will likewise be encouraged to share their acquired knowledge with friends, relatives, and other community members. In other words, creating a dynamic chain reaction of teaching will be a huge focus of this program. Moreover, we wish to spread the effectiveness of our PMTCT program from northern Uganda to other parts of the country. After all, “addressing maternal and child health comprehensively will require training more health workers; strengthening referral networks between communities, health centers, and hospitals; and ensuring adequate supplies at care centers- all elements of a robust health system” (4). There may be potential opposition from the local context regarding the empowering of women our services inevitably (and justly) bring. According to the Foundation for Sustainable Development, “women face . . . discrimination, low social status, lack of economic self sufficiency, and greater risk of HIV/AIDS infection” (5). Because women typically have lower status than men in Uganda, some natives may potentially view this education and empowerment of women as a threat to their culture. The best way to address it will be to involve the mothers boyfriends, husbands, etc as much as possible in the lessons and counseling. Promoting equity is a crucial measure and indicator of a successful program. Finally, any other existing NGOs in the area who are doing similar PMTC work may create conflict with our plan. There may be some “turf war” as different NGOs commonly have different agendas. The best way to address any NGO conflict is to do preliminary research to ensure we set up the PMTCT care services in areas that are not disrupting any “parallel programs”. AIDS Education and Research Trust. “Preventing PMTCT.” AVERT. Web. 9 Mar. 2014. <http://www.avert.org/preventing-mother-child-transmission-pmtct-practice.htm>. AIDS Education and Research Trust. “WHO Guidelines.” AVERT. Web. 9 Mar. 2014. <http://www.avert.org/who-guidelines-pmtct-breastfeeding.htm>. Bannink-Mbazzi, Femke, MA. “High PMTCT Program Uptake and Coverage of Mothers, Their Partners, and Babies in Northern Uganda: Achievements and Lessons Learned Over 10 Years of Implementation (2002–2011).” Journal of Acquired Immune Deficiency Syndromes 62.5 (2013). JAIDS. Lippincott Williams & Wilkins, Inc., 27 July 2012. Web. 09 Mar. 2014. <http://journals.lww.com/jaids/Fulltext/2013/04150/High_PMTCT_Program_Uptake_and_Coverage_of_Mothers,.20.aspx>. Farmer, Paul. Reimagining Global Health: An Introduction. Berkeley: University of California, 2013. Print. “Gender Equity Issues in Uganda.” Gender Equity Issues in Uganda. Foundation for Sustainable Development. Web. 09 Mar. 2014. <http://fsdinternational.org/country/uganda/weissues>. "HIV Prevalence in Uganda." UKEssays.com. 11 2018. All Answers Ltd. 04 2019 <https://www.ukessays.com/essays/health/hiv-prevalence-uganda-9467.php?vref=1>. "HIV Prevalence in Uganda." All Answers Ltd. ukessays.com, November 2018. Web. 19 April 2019. <https://www.ukessays.com/essays/health/hiv-prevalence-uganda-9467.php?vref=1>. UKEssays. November 2018. HIV Prevalence in Uganda. [online]. Available from: https://www.ukessays.com/essays/health/hiv-prevalence-uganda-9467.php?vref=1 [Accessed 19 April 2019]. UKEssays. 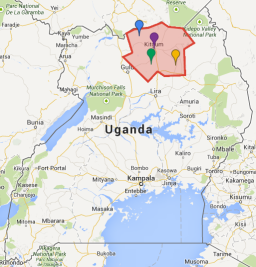 HIV Prevalence in Uganda [Internet]. November 2018. [Accessed 19 April 2019]; Available from: https://www.ukessays.com/essays/health/hiv-prevalence-uganda-9467.php?vref=1.